Two people were injured and a third left in shock by an axeman who then ran amok inside a historic abbey. A 62-year-old man was taken to hospital with serious lacerations after the attacker - armed with two small axes or hatchets - went on the rampage in Waltham Cross, Hertfordshire. 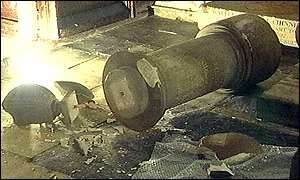 He then burst into the church in Waltham Abbey, in Essex, and used the weapons to damage the pulpit, organ, statues and at least one historic stained glass window. The cost of the damage is estimated at more than £200,000. Off-duty police officers in the abbey helped usher others inside to safety and raised the alarm. A 47-year-old local man was arrested in the abbey in connection with the attack and taken for questioning. Police were also investigating reports of a more minor assault in Essex where a woman, suffering from shock, was taken to Chase Farm Hospital, and a man was left injured. Officers were first alerted to reports of an attack in Highbridge Street, Waltham Cross, at about 1330 on Friday. Several cars were damaged between the street and the town's abbey - reputed to be the burial spot of King Harold. Canon Martin Webster, vicar of the abbey, said the "frenzied attack" started when the man became involved in a dispute some distance from the abbey. After damaging vehicles he burst into the church, "running amok" with an axe in either hand for some five to six minutes. "He got into the sanctuary and really had a go at the heart of our church, that's what is most upsetting," Mr Webster said. "He was shouting but it was hard to hear what he said over the noise of him hitting things. "He was clearly in an agitated state but quite determined. "It was upsetting, but at the time we were more concerned with making sure staff and members of the public had left the building. "But when he started to tackle the organ I did want to say to him, 'Please don't do that'." Church warden Linda Jewson said the historic stained glass windows in the abbey's 14th Century Lady Chapel had been smashed. "He just really ran amok into the church and wrecked it - the pulpits, the organ, a very old stained glass window, the rear at the back of the altar - it has been very badly damaged," she said. "We are just in total and utter disbelief about the state of the church." "The cost of the damage could be up to £200,000"
"We're thankful that there were not more injured"
"It's a lovely town, you'd never think anything like this would happen"